Baking powder is a blend of acid (most commonly calcium acid phosphate, sodium aluminum sulfate or cream of tartar) and alkali (sodium bicarbonate is known commonly as baking soda). By adding water to this mixture, a chemical reaction is achieved, producing carbon dioxide which is trapped in tiny air pockets in the dough or batter. Heat releases additional carbon monoxide and expands the trapped carbon dioxide gas and air to create steam. The pressure expands the trapped air pockets, thus expanding the overall food. The most commonly used baking powder is the double-acting, which can be readily found in any grocery store. The other two are becoming increasingly difficult to find. Be sure to read labels carefully to determine which type you are working with. Those who have older recipes calling for tartrate or phosphate baking powders will probably have to go to an imported foods purveyor or order from abroad. Baking powder does lose its potency over time. After opening, do not trust the expiration date. Once opened, it can lose its punch in a matter of months, regardless of the expiration date. You should always proof your baking powder before using it in a recipe by pouring 1/3 cup of hot tap water over 1/2 teaspoon of baking powder in a cup. The mixture should bubble enthusiastically. If it does not, toss it out. Be sure to thoroughly mix baking powder with other dry ingredients before adding any liquid. 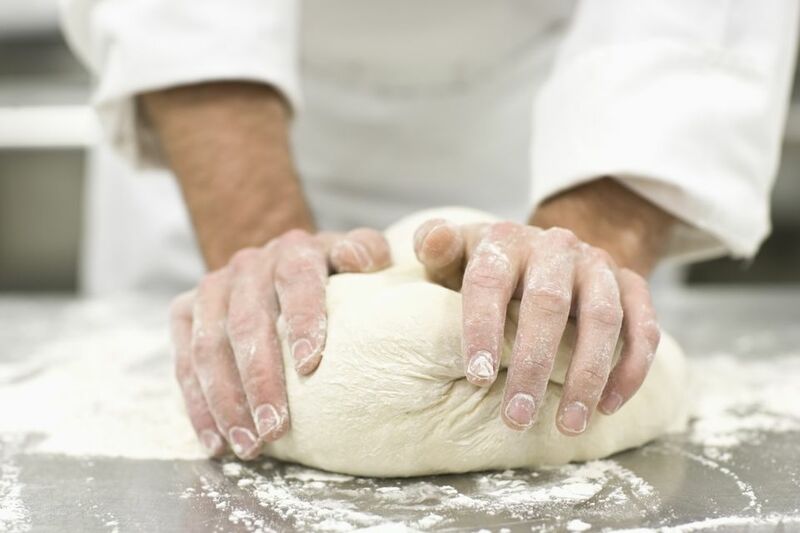 Commercial baking powders have a one-year shelf life if stored and sealed in a cool, dry place. If you find yourself without baking powder, you can make your own in a pinch. For 1 teaspoon of baking powder, mix 1/2 teaspoon of cream of tartar with 1/4 teaspoon baking soda. If you plan to mix your own to store, you must also add 1/4 teaspoon of cornstarch to that ratio, as the cornstarch will absorb any excess moisture in the storage container and avoid a potential premature reaction. Also keep in mind that homemade baking powder works faster and at a lower temperature, so put your recipe together quickly. You must also take care in substituting buttermilk for regular milk when using baking powder, as it upsets the balance of alkali to acid. Buttermilk has more acid than regular milk, which will reduce the carbon dioxide released and thwart the leavening process. To achieve the desired result when using buttermilk instead of milk, substitute baking soda for some or all for of the baking powder. For each cup of buttermilk used in place of sweet milk, reduce the amount of baking powder by 2 teaspoons, and replace with 1/2 teaspoon of baking soda. High altitudes will also affect the amount of baking powder needed in a recipe. Atmospheric pressure affects the reaction of carbon dioxide. Air pressure is lower at higher altitudes, the carbon dioxide expands more; and thus, less baking powder is needed. If you do not cut back, the texture will be rougher. This may take a little experimentation for your particular high altitude.